Commemorate the 500th anniversary of the Protestant Reformation by watching Stephen Chester’s lecture, “Reading the Bible with Luther after 500 Years: Reflections on Luther’s Legacy and Why It Still Matters.” The recording is available here (lecture begins at 8.20, with image corrected at 12 minutes). As both Bible translator and interpreter, Martin Luther revolutionized the experience of engaging God’s word for millions of Christians. Yet 500 years later, just as in his own lifetime, Luther’s legacy is still very much contested. What was the nature of Luther’s achievement with the Bible? In the midst of all the controversy surrounding Luther, can we gain a clear picture of his contribution? And as readers of Scripture today, what should we be thankful for and what must we be cautious about? What is best left in the sixteenth century and what might still be vital for us as we struggle faithfully to interpret the same texts in and for contemporary contexts? Join us October 27 for a public lecture commemorating the 500th anniversary of the Protestant Reformation, co-sponsored by North Park Theological Seminary and the Commission on Covenant History. Delivering the lecture is New Testament professor Stephen Chester, whose Covenant Quarterly article, “Reading Paul with the Reformers,” draws from his recent book, Reading Paul with the Reformers: Reconciling Old and New Perspectives (Eerdmans, 2017). 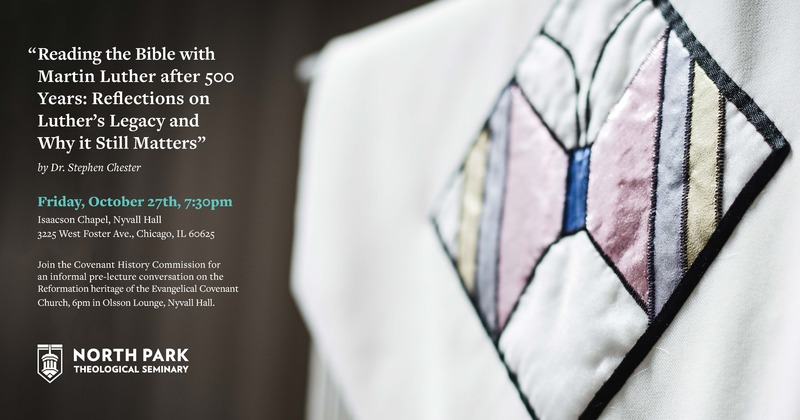 “Reading the Bible with Martin Luther after 500 Years: Reflections on Luther’s Legacy and Why It Still Matters” will begin at 7:30pm in Isaacson Chapel, Nyvall Hall, located on North Park’s campus, 3225 W. Foster Avenue. Please join us! For those not in the Chicagoland area, the lecture will be recorded and subsequently published here. How has your research impacted your own reading of Scripture? I teach a class on the “History of Biblical Interpretation” that spans from early church to contemporary interpreters. This course has not only enriched my own thinking about and engagement with Scripture but also helped me locate the Protestant Reformers within this larger history. One of the things that strikes me most about pre-modern readings of Scripture is that they steadfastly keep before them a sense of the purposes for which Scripture (as a text of a faithful community) is given—namely, that Scripture is a gift of God to God’s people to reveal God’s saving purposes centered in Jesus Christ. This, therefore, refocuses one’s purposes for reading: it is not so much for the exact knowledge one can obtain or about employing the exactly right method of reading (though, it certainly secondarily could be some of these things); it is first and foremost an opportunity to encounter God in Christ through the intercession of the Holy Spirit. And, as pre-moderns describe this, this encounter promises to be transformative: to call one out of one’s own self-absorbed ways and perspectives to a journey toward holiness and wisdom—toward Christ, the very Wisdom of God. Thus, the journey of reading Scripture is not really about finding that right method. Pre-modern theologians employed a large variety of methods, methods often clearly shaped by the available tools of their contexts and specific situations they were addressing. Moreover, pre-modern readers of Scripture affirmed that there can be multiple faithful readings of a text; there is not just a singular correct reading. For me personally, this allows for a freedom, beauty, and creativity in my encounter of the Triune God through Scripture and casts off the shackles of my anxiety to “find that one right meaning.” This is not to say, though, that faithful reading is boundless (with no limits, as if anything goes). Rather, pre-modern readers of Scripture paint a picture of a beautiful playground for biblical interpretation that is bounded by the convictions that constitute the core of Christian identity—convictions such as Trinity, centrality of Christ, christology (two natures of Christ), incarnation, belief in the Holy Spirit, and commitment to the church in which many pre-modern theologians point to the Apostle’s Creed as a guide to these core convictions of Christian identity about which Scripture testifies. In your article, you make the point that the Reformers’ affirmation of Scripture’s clarity “could never entail a larger array of persons claiming to have the singular, authoritative reading of Scripture” but that “this may very well be the reality in many Protestant churches today.” How have you seen this play out practically in the church? Over the next few weeks we’ll feature a series of responses to Lenore Knight Johnson’s study, “Four Decades Later: Credentialed Clergywomen in the ECC.” We begin the series with a letter issued June 12, 1989, from the Board of the Ministry, responding to the ten-year study conducted by Mary Miller. The letter was written by Jean Lambert on behalf of the Board, and is reprinted in Kelly Johnston’s article, “Jean C. Lambert: Covenant Pastor, Theologian, Pioneer,” pp. 16-19. An open letter to each woman seeking to obey Christ’s call to ministry in the Covenant Church, both volunteer lay workers in local congregations, and pastors, missionaries, and staff ministers. We have been thinking together about the situation of women and men in ministry in the Covenant Church, and we want first to affirm some convictions, and then offer some interpretation we think important. We are committed to an inclusive ministry in pilgrimage toward a whole church. We care about you. We value your commitment to Christ, respect your willingness to study and prepare for ministry, desire to be your colleagues. We hear your pain and respect your anger, as we heard it expressed by some of you in Mary Miller’s report of your responses to her questionnaire, published in the Covenant Quarterly. We are distressed by the continuing atmosphere of coolness or hostility encountered by all too many women who hold positions of leadership throughout the Covenant church. As part of our ongoing work in a church always being reformed by God’s Spirit, a church growing more whole as we believe Christ intends, we urge you to join us in considering some “facts of life” we believe affect our common life in church work: the search for a call, the consideration of volunteer possibilities, the selection or interview process, entering into work, how one is received, how one perceives oneself in ministry, how we respond to situations of frustration, conflict, and fulfillment. We think putting these facts into open conversation will help us all be stronger, saner, and more faithful. Fact 1: American society is sexist, specifically masculinist. (It is also racist, ageist, classist…but we aren’t addressing all of that here!) Though we do not understand it fully, it is clear that sexism is both a psycho/cultural bias and complex of social institutions. It operates largely unconsciously, though its “symptoms” may be observed by the seeing eye. This complex reality – sexism – is based on an ancient intuition that the biological differences between men and women are a natural and revealed “message” about superiority/inferiority, value and worthlessness, competence/incompetence, appropriateness/inappropriateness. The faculty and staff of North Park Theological Seminary offer the following statement in response to our current national climate. Though we write primarily to our students, we hope to bless our larger community of faith as we all engage in dialogue, discernment, and action. The United States has experienced a contentious election and post-election season marked by fear, polarization, and violence. The political climate reveals longstanding national sins of racism, elevation of whiteness, misogyny, nativism, and economic disparity. As faculty and staff members of North Park Theological Seminary who represent varying degrees of privilege and power, we join our voices with those who are most vulnerable. We submit to the Lordship of Christ who humbled himself unto death. As members of his body, we strive to consider others above ourselves (Phil. 2:2–8) and to serve one another in humility (Matt. 20:26–28). As one body, if one member suffers, all suffer (1 Cor. 12:26); if one weeps, the body laments with them (Rom. 12:15). A large part of our community is weeping. The fear of deportation is real. The anxiety of being assaulted is real. The fear of being forgotten or mistreated is real. Many people of color, women, and other marginalized groups feel increasingly alienated not only in the political context but in much of the white evangelical culture as well. Regardless of where Christians stand politically, the gospel demands we recognize vulnerable populations among us who find themselves further marginalized in the wake of the recent election. 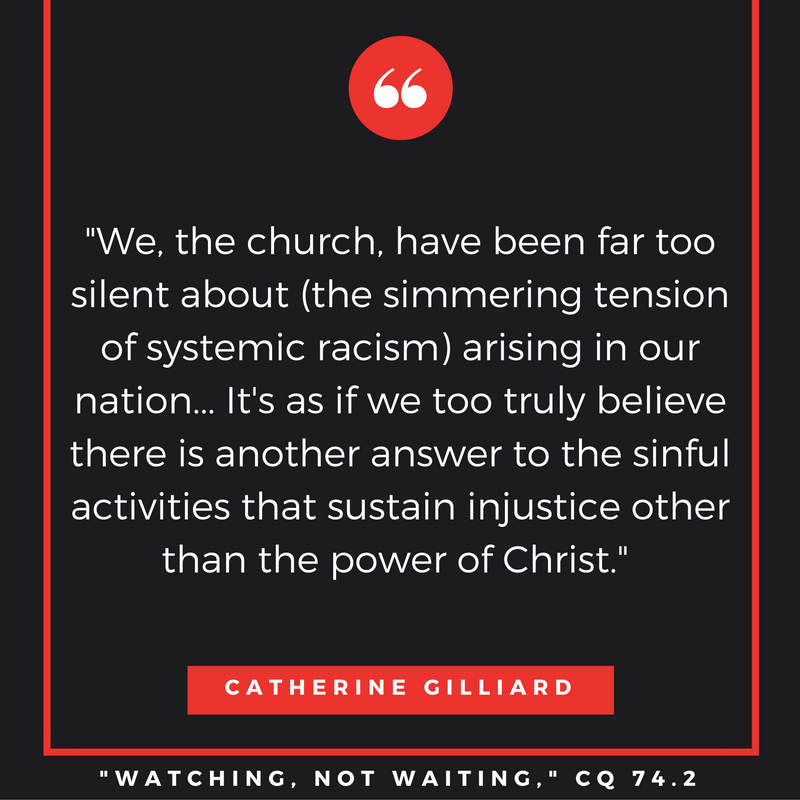 The gospel also demands that Christians recognize ways we benefit from and participate in structural injustices. Ignoring policies that denigrate and even endanger vulnerable groups is not a faithful option, even if privilege allows some to do so. When we have power, we use it justly and for the good of all. In the midst of real suffering within our community, we seek not only to love our neighbor but to know our neighbor (Lk. 10:29), through our conversations, classroom discussions, and times of prayer. We hope to embody a community in which walls of hostility are broken down (Eph. 2:14) and where love casts out all fear (1 John 4:18). Our Aug/Nov 2016 issue of the Covenant Quarterly focused on the 125th anniversary of North Park Theological Seminary. Historians explored North Park’s origins (Philip J. Anderson) and David Nyvall’s founding vision (Scott Erickson). Former seminary student and professor John Weborg reflected on his rich experience at NPTS, and Al Tizon cast a portrait of the ideal seminary graduate seminary’s should be developing. Finally, seminary dean David Kersten and ECC president Gary Walter outlined challenges and opportunities facing North Park Seminary as it looks to the future. The conversation continued on Forum, as a variety of scholars and pastors discussed the impact diversity should have on seminary curriculum (Phillis Sheppard, Mark Tao, Willie O. Peterson, & Jo Ann Deasy), and as current professor and former NPTS president and dean Jay Phelan responded to articles by Kersten and Walter. Thanks to all who contributed to our fall issue and Forum discussion. The upcoming Quarterly issue (February 2017) features the fourth decadal study on Covenant clergywomen, surveying and assessing the status of Covenant women in ordained ministry forty years after the ECC’s 1976 vote. The two articles that accompany the study (1) look back at the life and work of one of the first women ordained in the Covenant and (2) even further back to the range of ministry roles open to women within early German Pietism. Stay tuned for publication – and please contact us if you would like to contribute to related Forum articles or recommend another author. We welcome your input! Jesus teaches his disciples about the pain and suffering that precede a new birth. Jesus urges the disciples to remain awake so they do not miss God’s work in the middle of the chaotic events unfolding around them…. And this is my call to the church today: we too must be watchful. This week we watched peaceful demonstrators march to the seats of government power in city after city, bringing awareness to racial injustices that plague communities across this nation. Jesus is no stranger to the unrest we have seen; in our text Jesus warns his disciples that persecution will come. Jesus himself and his disciples were betrayed, handed over to authorities, beaten, thrown in jail, and eventually sentenced to death. This is also the journey of justice marked for the church today. The unrest in city after city is not just about the death of Michael Brown, no matter how badly organizers need a face as a banner for the movement. What is resonating with people throughout this nation is not the unrest in Ferguson alone. What is resonating in city after city are the signs of the simmering tension of systemic racism present across this country, racism that those in positions of influence and power do not want to discuss or confront. What’s resonating with people about Ferguson is how signs of racial and class tensions present in their own communities are not being discussed either. And sadly we, the church, have also been far too silent about the tension arising in our nation—and far too silent about the present signs of God’s kingdom breaking through, even as the violence increases. The voices speaking about injustice are rarely people of God who bring the hope of Christ into the dialogue. 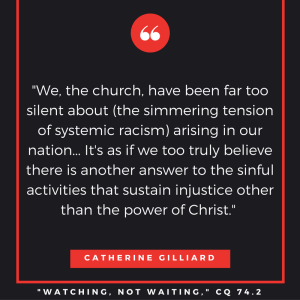 It’s as if we too truly believe that there is another answer to the sinful activities that sustain injustice other than the power of Christ. Jesus calls the church to a journey toward justice. The Holy Spirit calls the church to see what needs to change and then empowers the church to become advocates of that change. God calls the church to embody the power of the cross, crucifying evil and resurrecting God’s plan. God heals us! God delivers us! God uses us to proclaim and witness the Holy Spirit’s power to bring good news to all who are suffering in this world. So be on guard! Be alert! Keep watch, so those watching expectantly will not lose hope. It is through us, the church, that God’s love, forgiveness, and grace are experienced by the world. It is we the church who are called to bear witness to God’s power to dismantle walls of division and separation through our ministry of restoration, redemption, and reconciliation. From the good news according to St. Matthew, chapter 6 verse 10, we read, “Thy kingdom come. Thy will be done, on earth as it is in heaven.” It would be interesting to know how many voices have been raised all over the world in this particular prayer and in this petition this morning. Across all the barriers of race and class and denomination. Across the seas. Across misunderstandings…. It circles the globe, this heart cry of the human race. What will it be like when God’s kingdom comes? Do you hunger and thirst after it? Do you seek after it? Is your blood stirred by it like it’s stirred by a new home or a new car or a new washing machine? I am asking at this moment for you to decide in your own soul whether or not you can mix up God’s will with our keeping a tenth of our population submerged. 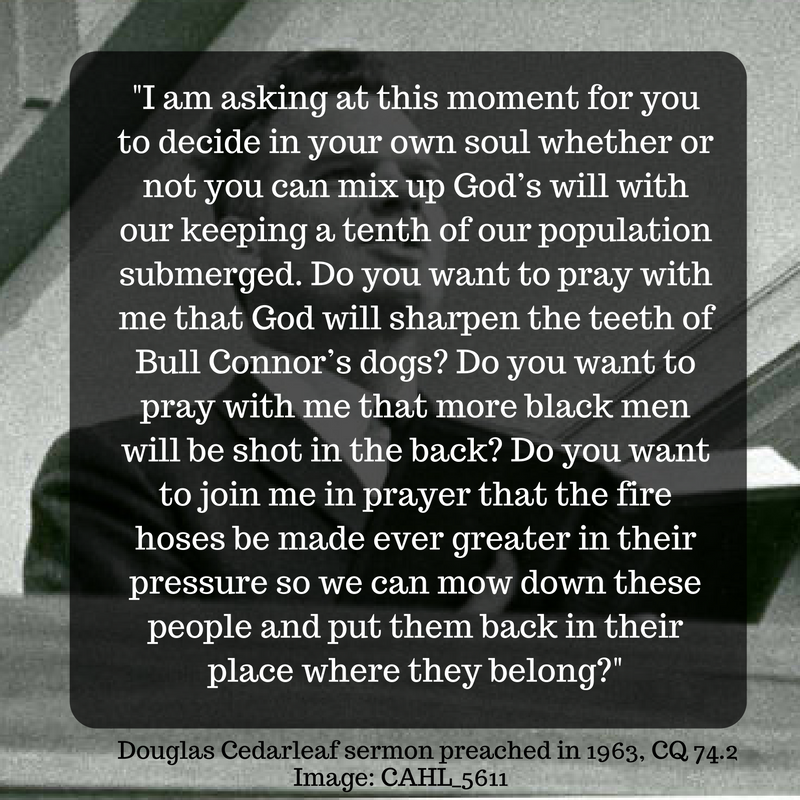 Do you want to pray with me that God will sharpen the teeth of Bull Connor’s dogs? Do you want to pray with me that more black men will be shot in the back? Do you want to join me in prayer that the fire hoses be made ever greater in their pressure so we can mow down these people and put them back in their place where they belong? Now if you choose this road, you have a right to do this and defy the law of America. You have a right to do this and defy the law of God, if this is your wish. But no one has ever defied the law of God and found peace. Read the full sermon here, then come back and discuss. Cedarleaf challenged his congregation to consider whether they really wanted God’s kingdom to come, given the way it would shake up the status quo. His question remains relevant. What would it look like for the Kingdom of God to be actualized in your job, your home, your community, and your life? What part might you be called to play in that? 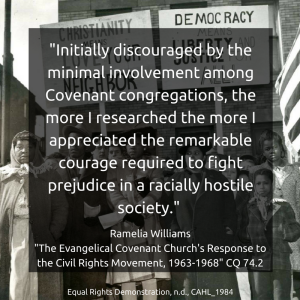 In the shadow of World War II, the Covenant Church took an official stance against racial discrimination. The Annual Meeting of 1944 adopted a resolution that reads in part: “We believe that all men are of one blood, and that all discrimination, based upon race, creed or nationality, is not in keeping with the Christian profession and life, and further, that it fosters conflict and war” (YB 1944, p. 133)….Between 1946 and 1968, nearly every Annual Meeting issued a resolution affirming the equal dignity of all people and rejecting racial discrimination, with only six exceptions. Annual Meeting resolutions did not emerge ex nihilo, but were brought by a commission that sought to resource local congregations and guide them in action. In 1944 the Covenant Church established the Committee on Civic Relations to mold a Christian mindset toward various matters of civility. The name was changed in 1948 to Christian Citizenship Commission (and in 1968 to the Commission on Christian Action). The Christian Citizenship Commission would study and offer its opinion on suffrage, civil rights, international wars, political affairs, social ethics, and other important civic issues. As recognized by the Covenant Commission on Christian Citizenship, resolutions would be effective only as “interpreted and carried out by the local committees” (YB 1962, p. 163). For this reason I surveyed two congregations located in cities that, historically, have served a prominent role in the denomination: Community Covenant Church in Minneapolis, Minnesota, and North Park Covenant Church in Chicago, Illinois. Read the full article here, including accounts of particular Covenant congregations and publications. 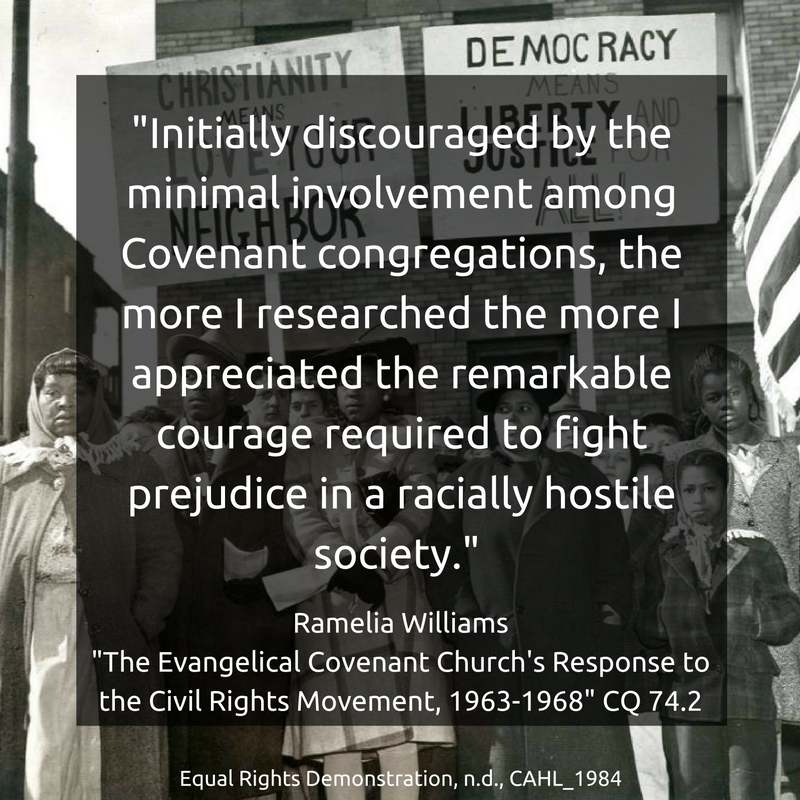 The author expresses that her initial discouragement at the minimal involvement of Covenant congregations in the civil rights movement gave way to greater appreciation through her research. Has Williams’s research impacted your own thoughts on this matter? 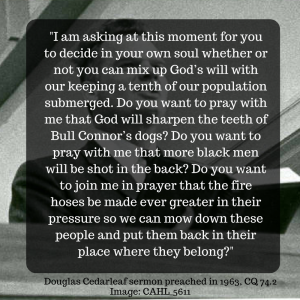 A running theme through this piece is the ECC’s expressed desire to “bring our practices into line with our beliefs” (Covenant Yearbook 1950, p. 202), and the denomination’s attempts to empower local congregations to that end. How might Covenant polity have impacted – and continue to impact – those attempts, for better or for worse? How does Williams’s historical study relate to the nation, denomination, and local church today? What can it teach us? 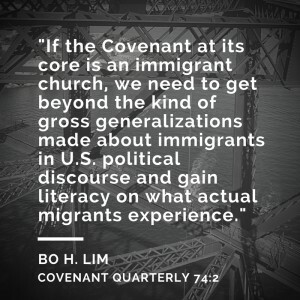 The Evangelical Covenant Church is an immigrant church, founded by Swedish immigrants in 1885. At its centennial celebration in 1985, Krister Stendahl exhorted the denomination to maintain its immigrant identity as it moved into its second century. Twenty five years later, marking its 125th anniversary celebration, the denomination yet again affirmed its character as an immigration church as central to its identity. The Covenant’s 2014 resolution on immigration opens with a summary of this identity, providing the foundation for the ethical discussion/exhortation that follows. 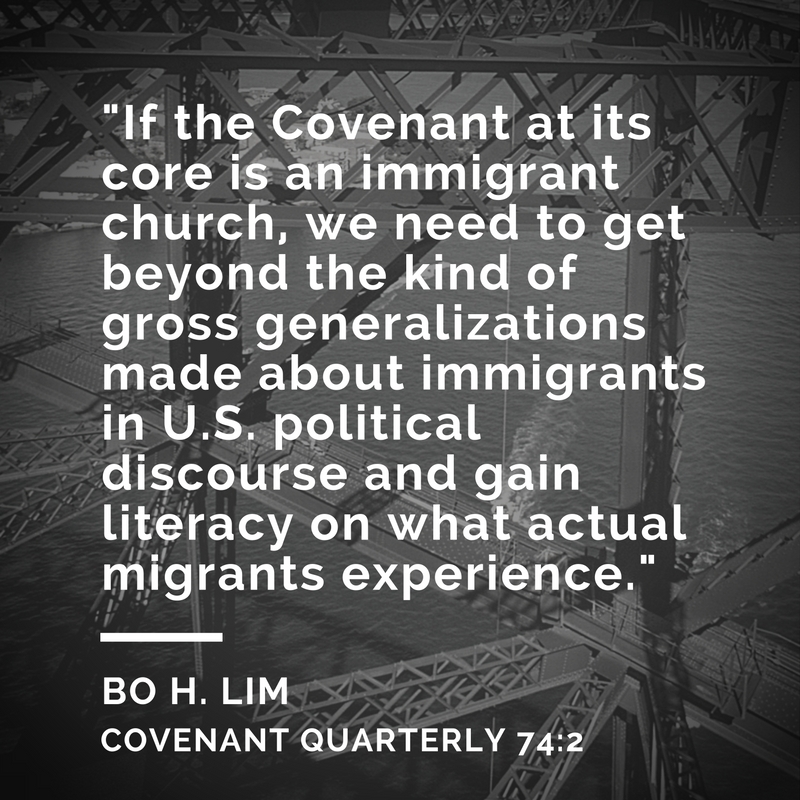 The aim of this paper is to provide a better understanding of the biblical phenomenon of exile as it relates to immigrant communities so that church leaders might better appropriate this biblical motif for ministry. There was no singular exilic experience. To assume that all Israelites were weeping by the rivers of Babylon under duress from foreign captors is simply inaccurate. Neither should one assume that every Israelite was able to climb the Babylonian social ladder and influence the royal court in the manner of Daniel and his friends. What these approaches reveal is that migration, while impacting groups, affects people differently at an individual and family level. In addition, generations within families may have experienced the exile in markedly different ways. For the poor peasant, exile may have meant no geographical relocation but experiencing colonization by the Babylonian economic empire. For a Judean youth from a class of social elites, exile may have meant living in a Jewish enclave in Babylon and exercising a relatively free existence. Just as reading prophetic literature requires attention to the exegetical nuances of myriad migratory experiences of ancient Israel, Christian ministry demands that the church address the diverse experience of migrants and minority populations. It is no less irresponsible for me to say that the experiences of all immigrants to the U.S. are the same – even those experiences within a single ethnic group – than to assume that the exilic experiences addressed in Jeremiah, Isaiah, Psalm 137, Daniel, and Esther are all the same….Faithfulness requires knowing the particularities of each biblical text as well as the particularities of each individual experiencing migration. To flatten the experiences and texts of migration into one uniform category is not merely an act of intellectual dishonesty; it is an unwillingness to listen to the distinct message of particular texts and a disregard for the unique ways people are impacted by migration. Given that as of 2015, 244 million international migrants live abroad and these numbers continue to climb, the church must develop resources to minister to these populations. What narratives inform your thoughts about exile and migration? Biblical? Political? Historical? Experiential? What narratives do you believe inform the thoughts of the people in your circles? How do those narratives impact attitudes and actions? 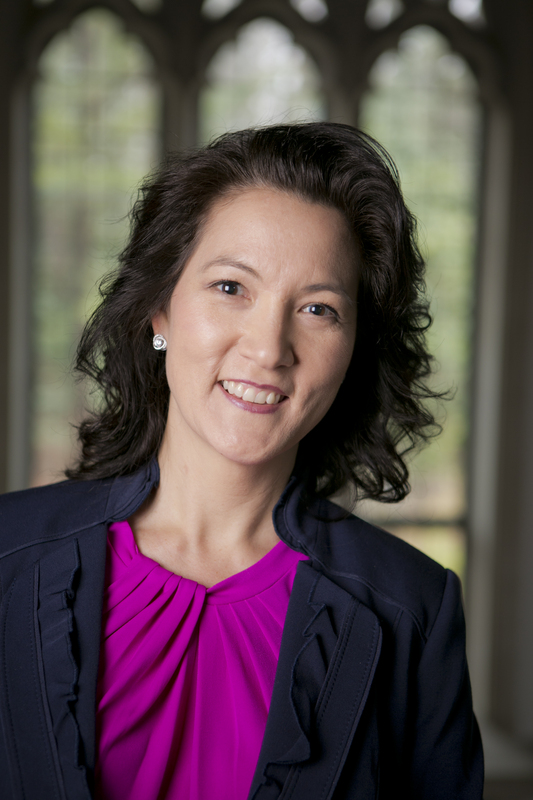 Lim mentioned several people who have spoken into issues surrounding exile and migration, including John Ahn, Steed Davidson, and Frank Ames. Who are some of your favorite writers, thinkers, practitioners and theologians who are speaking into this topic, and what do they have to say?